From the moment I picked up Girls with Sharp Sticks, I found myself drawn in by its spell and mysteries. Right away we’re thrust into a setting of what is ostensibly a school, except I was seriously weirded out by the major Stepford Wives vibes and surreal attitudes of its students. The young women in this all-girl elite boarding school are all beautiful, poised and well-behaved—unnaturally, painfully so. Their bizarre curriculum includes subjects and activities such as “Growing a Beautiful and Prosperous Garden”, while their report cards employ a scale to measure their level of obedience. The mostly male teaching staff have a creepy tendency to get too handsy and seem all too comfortable in taking advantage of the girls’ eagerness to please, hiding their true intentions behind patronizing smiles and empty warm words. So, exactly just what the hell is going on at this so-called “Innovations Academy”? The need to find answers was what kept me turning the pages. 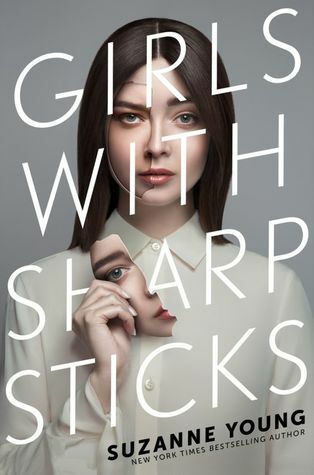 The plot of Girls with Sharp Sticks follows Philomena (Mena to her friends), who is one of the dozen perfectly proper and physically flawless young ladies in her peer group at the school. The girls rarely get to leave the premises, except for the rare field trip where they are closely chaperoned. On one such outing, however, Mena manages to slip the notice of the academy guardian, chancing to meet a boy named Jackson while buying candy at a gas station. But their moment doesn’t last long before Guardian Bose catches Mena, berating her cruelly before violently dragging her back to the bus. From them on, she begins questioning the ways of the school and the behaviors of her teachers. Then when one of the girls is suddenly taken away for “Impulse Control Therapy”, Mena starts to fear for herself and her friends. What are the little “vitamins” the doctor dispenses to them each night? Why won’t their teachers allow them any interaction with the world outside the school? And why did Jackson look upon her with such confusion and horror when she told him what goes on inside its walls? Gradually, the truth of Innovations Academy comes out as the story unfolds, in a way that almost sneaks up on you. Of course, the feelings of “wrongness” about Mena’s entire situation are present from the very first page, but they start off subtle—particularly because the reader takes their cues from the protagonist in response to the various scenarios. The genius is in the way Mena is written, and the progression of her character growth as her thinking and attitudes transform over time. She begins this tale as one of the academy’s top students, completely buying into their mission and methods. Instead of feeling frustrated with Mena though, I think this only made her a more likeable character and made it easier to sympathize with her—for even as when she was beating herself up over the gas station incident, I burned with indignation on her behalf, knowing that soon enough she will be looking back on this moment with a whole new perspective. Indeed, despite the conditioning, Mena is a strong and tenacious girl with a curious streak that cannot be suppressed for long, no matter how hard the academy tries to control her life. It is only a matter of time before her eyes are opened and she realizes that not only are Innovations Academy’s methods unusual, the staff have also been lying to her and her friends about what they’ve been doing at the school. Speaking of which, one of the most notable strengths of this book is the bond between all the girls. While it was Jackson who first “awakens” Mena to the possibility that not all is at it seems, I was glad to see ultimately that his role was limited and that it was she and her friends who worked together to save themselves. At its heart, this story features a strong sense of female friendship and sisterhood, something we honestly don’t get to see enough in YA. I also loved that Suzanne Young did not shy away from darker or more difficult themes, including physical violence or psychological manipulation and abuse. While this resulted in some distressing moments or scenes that made this book hard to read, the overall mood of eeriness and suspense created was very effective. There’s a dreadful anticipation in knowing that none of the girls are safe, that every time you turn the page is another potential for a bombshell twist that brings bad news for Mena and her friends. But if you feel angry, disturbed, or creeped out at anytime while reading this novel, then that means the author did her job right. All in all, I had a great time with Girls with Sharp Sticks. I would take a look if you enjoy intense dystopian stories, but personally, what I loved best about this novel was the strong character relationships and reading about how these amazing young ladies banded together to support and protect each other. The ending was a little out of left field but not entirely all that shocking, considering all the other surprises in the plot. Regardless, this novel was absolutely worth the read and I look forward to Suzanne Young’s next installment in the series. This one sounds interesting! Would it be possible to read just this installment and not be too frustrated? Or is the ending a huge cliffhanger? Yes!!!! I loved this the major Stepford vibes sucked me right in. There were times when I was like- really?? These classes? lol And I did like how Mena slowly, over time, started realizing- this ain’t right! I know! I loved how everything about the school was just wrong, and you just knew there was a reason for all the strangeness, but you just don’t know what. I loved how the story just slowly revealed it to you! And haha, Jackson was a dope, I did not like him at all. Glad he got a small role. Oh yes I heard about this one and it looks good and perfect for me so I should try! I think you would have a lot of fun with this! Definitely want to read this at some point. I’ve always heard good things about Young’s books but have just never read them. Yeah, I didn’t realize she was also the author of The Program! I remember the cover of that book, and wanting to read it at one time! Yeah, I felt this was like a modern, YA-tized version of Stepford Wives – if that makes sense! Took the same idea and ran wild with it! This does sound really good. I’ll have to keep an eye out for this one. I’d be curious to hear what you think! So yours is the second awesome rating/review I’ve seen this week. I definitely need to get on the hold list for this one. Yeah it was a blast! Definitely worth grabbing from the library! Oh, this sounds like one of those books where the experience of reading it is part of the fun. May have to check this one out!